Buy US Made Drainage Mats and Commercial Kitchen-Restaurants, Institutional Kitchens and Industrial Work Stations. 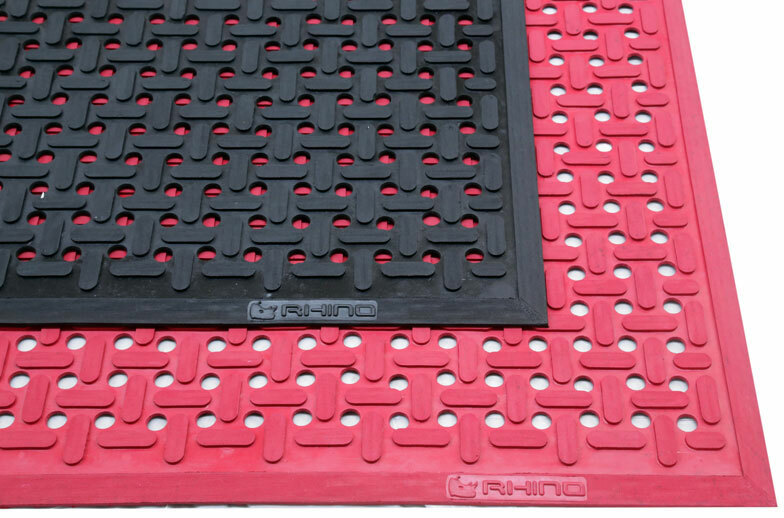 Drain-thru Mats are Anti-slip, Anti-fatigue and Durable. The necessity of drainage mats is well established in the food service industry, manufacturing, automotive service stations, car wash businesses, commercial kitchens and restaurants. Smart businesses know that anti-fatigue mats, drainage mats and anti-slip floor mats are an investment in its employees which is an investment in your company. Do NOT fear ‘slip n’ fall’ litigation. Buying drainage mats will give your BOARD members peace of mind. And besides, lawyers hate anti-slip floor mats. Our universal K-Series Meter drainage and commercial kitchen mat can be cut down to size without hindering the plug n’ hole connectors. This smart features enables wall to wall coverage in any size kitchen, work station or want area room, etc. This makes it practical to configure the largest or longest sized work stations. Bevel Size Wt. per Lin. Ft. 1/2"
The interlocking tabs enables custom lengths and widths to accommodate small up to platoon size mess halls kitchens and commercial kitchens.
. 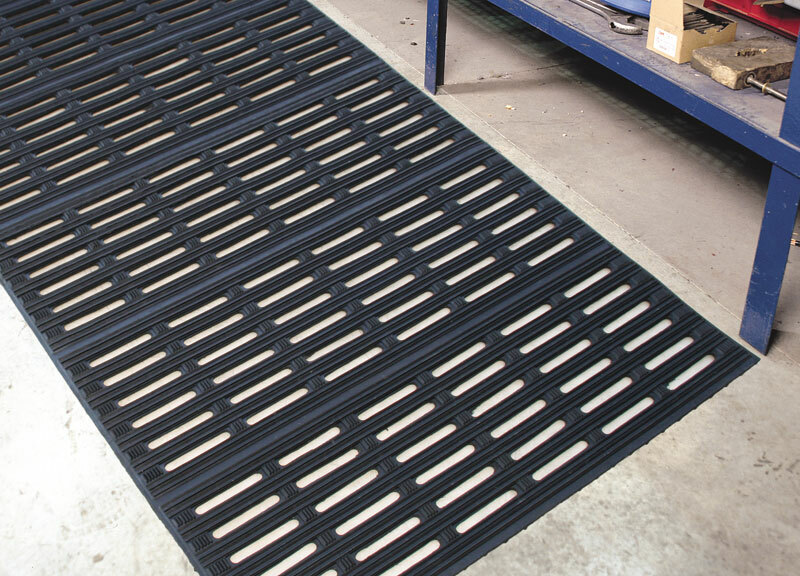 In addition to drainage features, these drainage mats and commercial kitchen mats are anti-fatigue. The textured crisscross pattern provides anti-slip features in wet and sludge-like environments. Specifications for commercial kitchen mats, K-Series. Weight Ea. Price Ea. 7/8"
Size Wt. per Lin, Ft. 1/2"
Wt. per Lin, Ft. 7/8"
Bevel Size Wt. per Lin, Ft. 1/2"
The K-Series Safety Tract Anti-Fatigue Mat is both anti-fatigue and a drainage mat. Like all CWF Flooring, Inc’s. 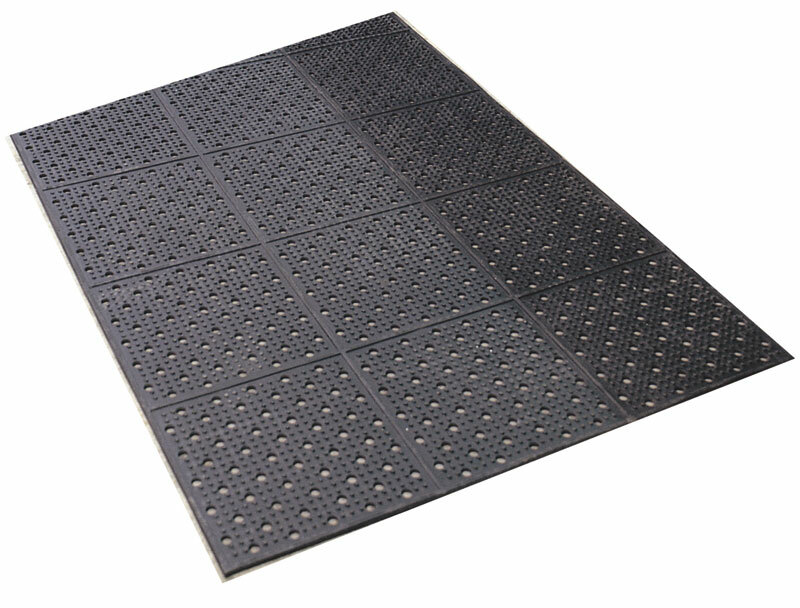 drain-thru mats, it’s perforated which will perform as an anti-slip mat and commercial kitchens & restaurants. Produced with grease-resistant rubber; this will prevent mat deterioration –Vs- non-treated rubber. Yellow caution borders add attractiveness and safety. The K-Series Safety Tract Anti-Fatigue Mat is chemical resistant to butyl alcohol, sodium hydroxide and other abrasive chemicals. CWF Flooring, Inc’s. K-Series Comfort Tract is light weight. This light weight feature will add convenience when washing, re-locating or reconfiguring. The Comfort Tract is a half inch thick with trip-free bevel edges of four sides. This smooth feature will provide effortless mobility of cart and dollies on & off the drainage mat. Even though it’s light weight, it maintains its heavy duty feature for commercial and industrial usage. Colors: Black (Grease Resistant), Thickness 1/2" *3x10, 3x15, 3x20 consists of multiple mats bonded. Bevel is removed for joints resulting in a slightly less overall length. 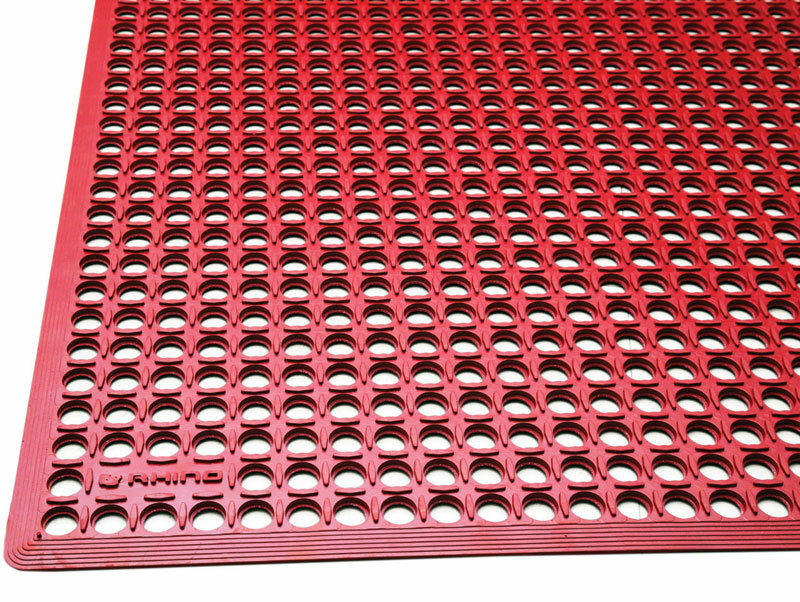 CWF’s K-Series Red Comfort Tract drainage mat is equally as light-weight as the Safety Tract Anti-Fatigue Mat. 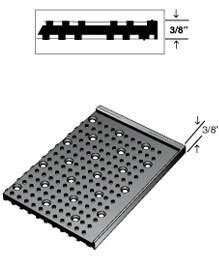 Comfort Tract drain-thru mat is ½” thick. Rubber is treated with grease proof properties. This mat is engineered to be used as a kitchen floor mat. This feature make is appropriate for greasy environments like kitchens, automotive repair stations. The beveled edges add easy cart access. The Uni-Mat is highly grease and oil resistant. This perforated kitchen and food service mat is formulated with Nitril, which enhances its grease resistance attributes. The under-side of this 3/8” thick commercial kitchen mat is roughly textured to form a secure floor to mat layer. The Uni-Mat is commonly used as salad bar mat, drink stations mat and near ice machines. 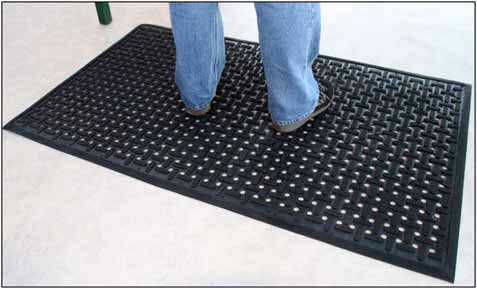 Size : Uni-Mat All Purpose Drain Thru Entry Mat 3ft.x5ft. Uni-Mat All Purpose Drain Thru Entry Mat, 3ft.x5ft. CWF Flooring, Inc’s. Tractor Mat features bi-directional slots to secure locomotive foot traffic. This provides secure footing with anti-fatigue properties. The bi-directional slots will enhance drain-thru and air-flow, hence, a quick dry feature. Manufactured with Styrene-butadiene (SBR); this will add abrasion resistance and hardness which will prolong the life of the rubber core. 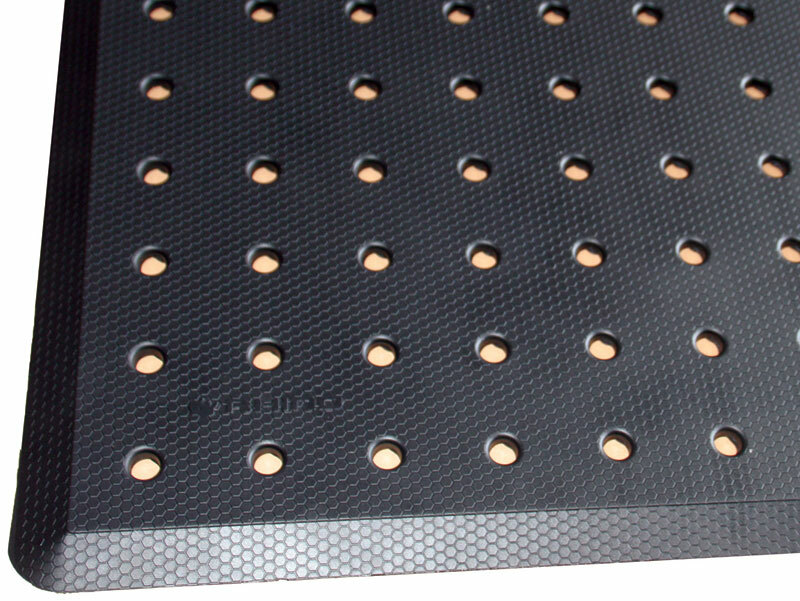 The added durability of this industrial perforated drainage mat will make it ideal for welding areas, heavy assembly and industrial work stations. Width Weight Per Lin. Ft. 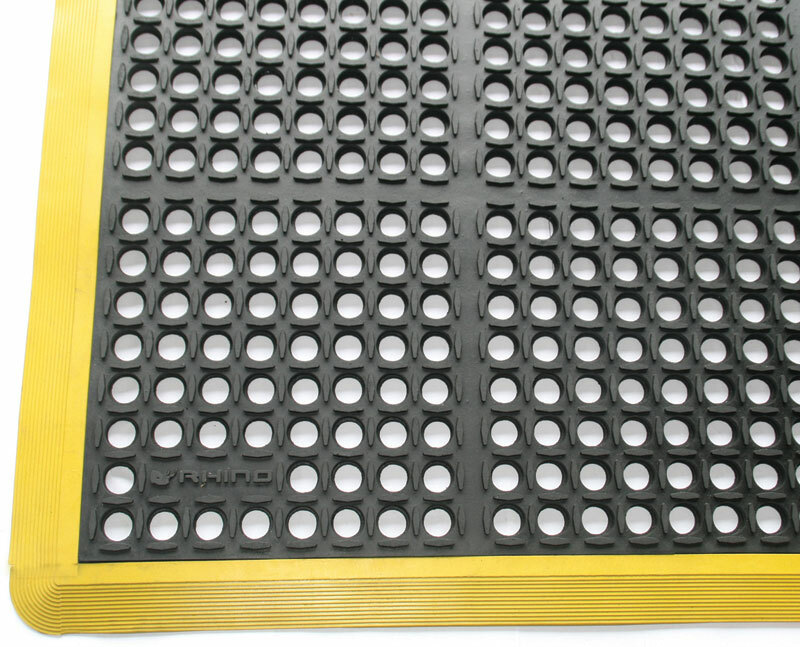 The Sudden Comfort drainage & anti-fatigue mat is manufactured using polyurethane (PU) sponge. .The PU foam core will minimize stress on ankles, feet, back and legs. The subtle beveled perimeter edge is designed for trip-free transition from floor to floor mat. As well, the beveled transition is decorative. 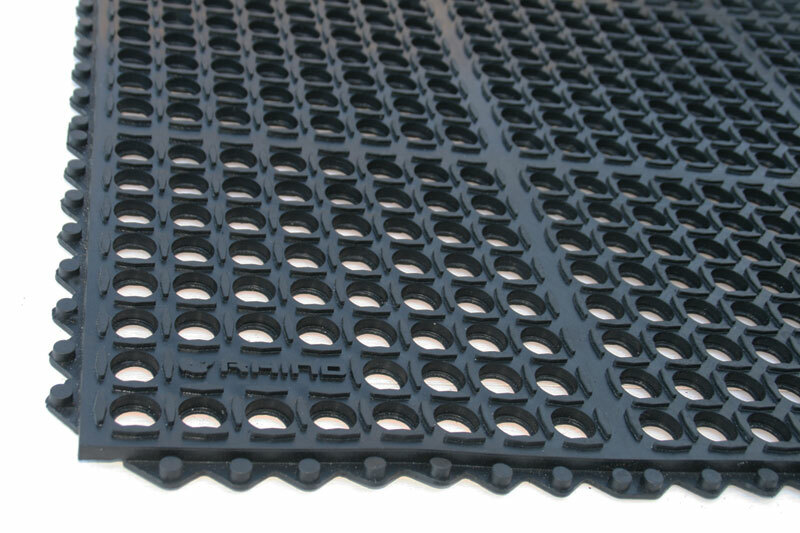 The Drain-X® Diamond Drain-Thru Anti-Fatigue Mat is a contemporary design and a multi-purpose drainage mat designed for bars, kitchen and factories. This design adds multi-size options for large matter kitchen areas. The diamond shaped holes enhance water drainage and maintenance. This low profile drainage kitchen mat does not need beveled edges. The triangular holes on the perimeter enable mat to mat connection without buying connectors or accessories. Size : Drain-X Anti-fatigue Mat 2ft. x3ft. Drain-X Anti-fatigue Mat 3ft. x3ft. The Omni Mat has been the mat of choice for decades in the food service industry. This commercial kitchen mat is reversible with knob on both sides. These reversible features will double the life span of other non-reversible perforated commercial kitchen mats. The round perforations will enable water and food products to flow through the mat while adding anti-slip features. Thickness 3/8", Color: black, Omni II is offered in cut lengths or full rolls 36 feet long. 1. We run a small restaurant in the Los Angeles, CA area and want a non-slip, anti-fatigue mat with drainage ability. The mat must be 3ft wide and run along side the serving counter which runs to the cashier. Which floor mat do you recommend. 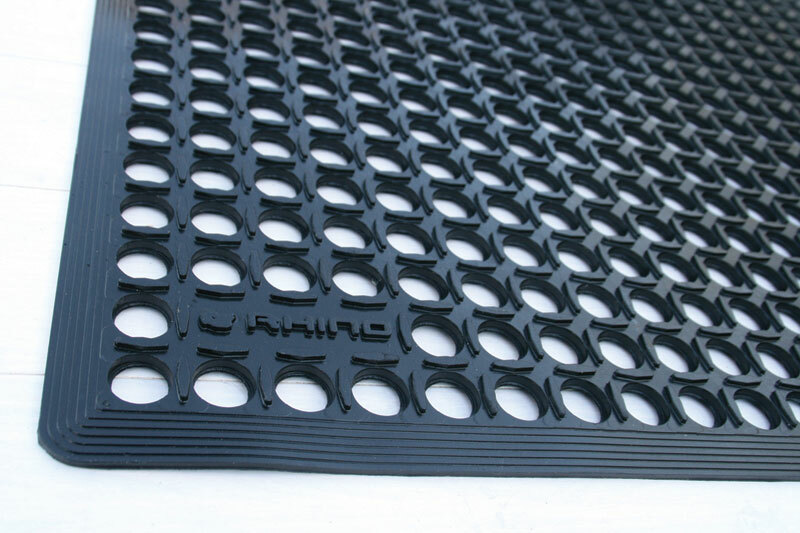 The Omni Drainage Mat is available in a 3s4, 3x20, 3x26 or 3x36. However, it’s only 3/8” thck so it will provide moderate anti-fatigue features, superior anti-slip qualityes and good drainage properties. If the layout of your restaurant permits, the sudden comfort anti-fatigue mat for the cashier area can be placed over the Omni Drainage Mat for added softness for the standing cashier. This applications of multiple types of matting is common, functional and can add design. 2. Our all you can eat buffet in Las Vegas, Nevada has problems in the self-serve drink areas. Customer are sloppy and just don’t give crap if they drop ice cubes, soft drinks or soft-serve ice crease on the floor. This creates a slippery hazard to our customers. Several times a year the restaurant management gets threats of slip & fall lawsuits. How can we prevent this hazard at our Las Vegas restaurant? Which floor mat do you recommend? The Uni-Mat is a common mat for this particular application. The floor mat is heavy so it will loose-lay securely. The mat borders are wide so the edges will not curl-up. A 3x5 Uni-Mat weighs 28 lbs., so the weight will add further enhancement to the loose-lay feature. This restaurant food service mat for drink stations, ice machines and salad bars will provide secure footing for customers and employees. 3. Can any of your floor mats be used as a urinal mat? No, urinal mat must be contoured in a certain way. The perforations in a urinal mat are very small. The perforations on a kitchen drainage mats are much larger. 4. We need a mat that will be appropriate in an oil change automotive service station. Which floor mat is best for an oil change service station? Firstly, a floor mat for an automotive service station will only minimize slipping. 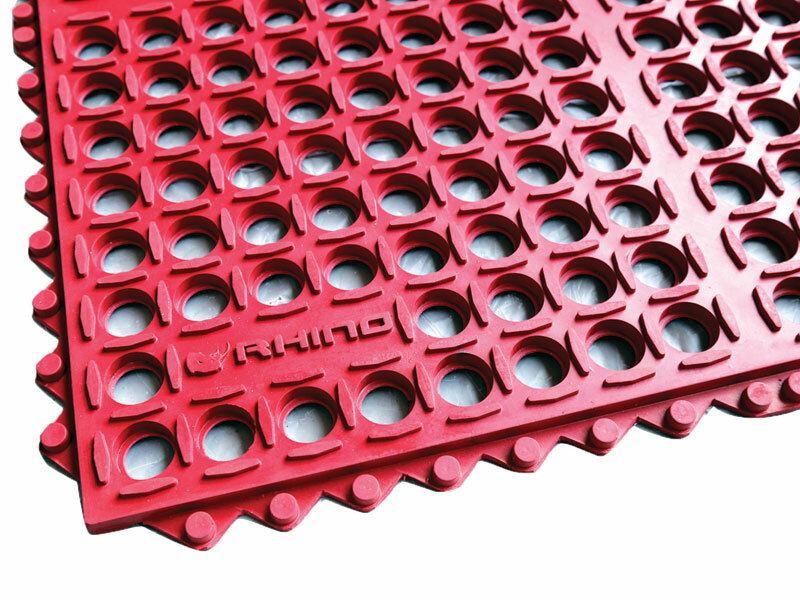 Frankly, there’s no such floor mat that is ‘slip-proof’ or ‘slip-resistant’ The mat best for an automotive repair shop is the K-Series RED Comfort Tract. These anti-slip car service station mats are highly textured, treated with grease-proof properties, ½” thick, and 3ft. wide with beveled edges. 5. Our bartenders want a new floor mat behind the bar. Which is the recommended bartender mat? Bartender mats are required to be anti-slip and equally anti-fatigue. The 3 x 10 x ½” thick counter mat is popular for bartenders. 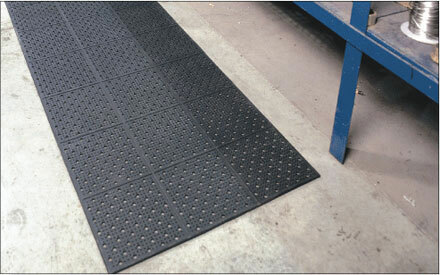 The Tractor Mat is recommended for bars, counters, welding areas and assembly-production lines. 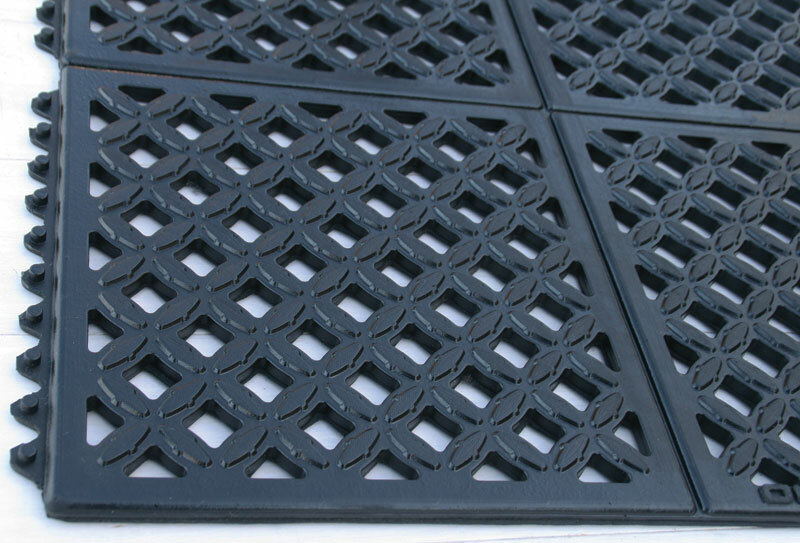 These floor mats have slotted holes to enhance anti-slip features and keep water below the standing area. 6. Our family owns a restaurant in Dallas, Texas. The layout of our kitchen is abstract. In other words, some walk-ways are only 3ft. wide, other areas 4ft. wide and the stove is in an island in the middle of the kitchen. Do you have a commercial anti-slip and drain thru kitchen mat that can make different layouts? Yes, indeed. The universal K-Series Meter drain thru mat is an interlocking kitchen that can configure to any width or length. This kitchen drain through mat can be cut by hand to produce any size without hindering the interlocking attributes. These universal kitchen mats are 36” wide by 36”, 48” or 60” long. Yellow or black beveled edges can still be connected on the side that is cut to your specifications. The customer is responsible to cut the kitchen mat to their specifications. 7. Last year we purchased some kitchen mats from you. We are satisfied with the quality. However, the mats are heavy and quite laborious to clean, actually, easy to clean but difficult to move to clean. How do you clean and wash these rubber kitchen mats? You’ll find the floor mat transporter will make things much easier to clean and transport the floor mats. The floor mat wash rack and transporter can hold several perforated kitchen mats. 8. We are looking for a more, well, attractive and decrative kitchen mat for home use. Indeed and admittingly so, our drainage mats are not a work of art. The drainage mats are purely functional. If you want a more colorful and textured home kitchen mat, CWF Flooring, Inc. can meet your needs.